For other uses, see Bloomery (disambiguation). A bloomery is a type of furnace once used widely for smelting iron from its oxides. The bloomery was the earliest form of smelter capable of smelting iron. A bloomery's product is a porous mass of iron and slag called a bloom. This mix of slag and iron in the bloom is termed sponge iron, which is usually consolidated and further forged into wrought iron. The bloomery has now largely been superseded by the blast furnace, which produces pig iron. 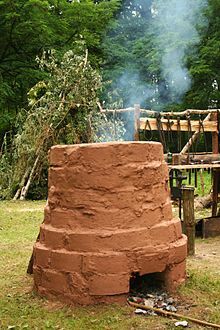 A bloomery consists of a pit or chimney with heat-resistant walls made of earth, clay, or stone. Near the bottom, one or more pipes (made of clay or metal) enter through the side walls. These pipes, called tuyeres, allow air to enter the furnace, either by natural draught, or forced with bellows or a trompe. An opening at the bottom of the bloomery may be used to remove the bloom, or the bloomery can be tipped over and the bloom removed from the top. The first step taken before the bloomery can be used is the preparation of the charcoal and the iron ore. The charcoal is produced by heating wood to produce the nearly pure carbon fuel needed for the smelting process. The ore is broken into small pieces and usually roasted in a fire to remove any moisture in the ore. Any large impurities in the ore can be crushed and removed. Since slag from previous blooms may have a high iron content, it can also be broken up and recycled into the bloomery with the new ore. In operation, the bloomery is preheated by burning charcoal, and once hot, iron ore and additional charcoal are introduced through the top, in a roughly one-to-one ratio. Inside the furnace, carbon monoxide from the incomplete combustion of the charcoal reduces the iron oxides in the ore to metallic iron, without melting the ore; this allows the bloomery to operate at lower temperatures than the melting temperature of the ore. As the desired product of a bloomery is iron which is easily forgeable, it requires a low carbon content. The temperature and ratio of charcoal to iron ore must be carefully controlled to keep the iron from absorbing too much carbon and thus becoming unforgeable. Cast iron occurs when the iron melts and absorbs 2% to 4% carbon. Because the bloomery is self-fluxing the addition of limestone is not required to form a slag. The small particles of iron produced in this way fall to the bottom of the furnace, where they combine with molten slag, often consisting of fayalite, a compound of silicon, oxygen and iron mixed with other impurities from the ore. The mixed iron and slag cool to form a spongy mass referred to as the bloom. Because the bloom is highly porous, and its open spaces are full of slag, the bloom must later be reheated and beaten with a hammer to drive the molten slag out of it. Iron treated this way is said to be wrought (worked), and the resulting iron, with reduced amounts of slag is called wrought iron or bar iron. It is also possible to produce blooms coated in steel by manipulating the charge of and air flow to the bloomery . As the era of modern commercial steelmaking began, the word bloom was extended to another sense referring to an intermediate-stage piece of steel, of a size comparable to many traditional iron blooms, that was ready to be further worked into billet. The onset of the Iron Age in most parts of the world coincides with the first widespread use of the bloomery. While earlier examples of iron are found, their high nickel content indicates that this is meteoric iron. Other early samples of iron may have been produced by accidental introduction of iron ore in bronze smelting operations. Iron appears to have been smelted in the West as early as 3000 BC, but bronze smiths, not being familiar with iron, did not put it to use until much later. In the West, iron began to be used around 1200 BC. China has long been considered the exception to the general use of bloomeries. It was thought that the Chinese skipped the bloomery process completely, starting with the blast furnace and the finery forge to produce wrought iron: by the 5th century BC, metalworkers in the southern state of Wu had invented the blast furnace and the means to both cast iron and to decarburize the carbon-rich pig iron produced in a blast furnace to a low-carbon, wrought iron-like material. Recent evidence, however, shows that bloomeries were used earlier in China, migrating in from the west as early as 800 BC, before being supplanted by the locally developed blast furnace. Supporting this theory was the discovery of 'more than ten' iron digging implements found in the tomb of Duke Jing of Qin (d. 537 BCE), whose tomb is located in Fengxiang County, Shaanxi (a museum exists on the site today). Smelting in bloomery type furnaces in West Africa and forging of tools appeared in the Nok culture by 500 BC. The earliest records of bloomery-type furnaces in East Africa are discoveries of smelted iron and carbon in Nubia and Axum that dated to between 1,000–500 BC. In Meroe particularly there are known to have been ancient bloomeries that produced metal tools for the Nubians and Kushites and produced a surplus for sale. Early European bloomeries were relatively small, smelting less than 1 kg of iron with each firing. Progressively larger bloomeries were constructed in the late 14th century, with a capacity of about 15 kg on average, though exceptions did exist. The use of waterwheels to power the bellows allowed the bloomery to become larger and hotter. European average bloom sizes quickly rose to 300 kg, where they levelled off until the demise of the bloomery. As a bloomery's size is increased, the iron ore is exposed to burning charcoal for a longer time. When combined with the strong air blast required to penetrate the large ore and charcoal stack, this may cause part of the iron to melt and become saturated with carbon in the process, producing unforgeable pig iron which requires oxidation to be reduced into cast iron, steel, and iron. This pig iron was considered a waste product detracting from the largest bloomeries' yield, and it is not until the 14th century that early blast furnaces, identical in construction but dedicated to the production of molten iron, were built. Bloomery type furnaces typically produced a range of iron products from very low carbon iron to steel containing approximately 0.2% to 1.5% carbon. The master smith had to select bits of low carbon iron, carburize them, and pattern-weld them together to make steel sheets. Even when applied to a non-carburized bloom, this pound, fold and weld process resulted in a more homogeneous product and removed much of the slag. The process had to be repeated up to 15 times when high quality steel was needed, as for a sword. The alternative was to carburize the surface of a finished product. Each welding's heat oxidises some carbon, so the master smith had to make sure there was enough carbon in the starting mixture. In England and Wales, despite the arrival of the blast furnace in the Weald in about 1491, bloomery forges, probably using water-power for the hammer as well as the bellows, were operating in the West Midlands region beyond 1580. In Furness and Cumberland, they operated into the early 17th century and the last one in England (near Garstang) did not close until about 1770. One of the oldest known blast furnaces in Europe have been found in Lapphyttan in Sweden, C14 dated to be from the 12th century. The oldest bloomery in Sweden, also found in the same area, has been C14 dated to 700 BCE. Bloomeries survived in Spain and southern France as Catalan forges to the mid-19th century, and in Austria as the Stückofen [fr] to 1775. A view of the bloomeries ('Catalan forges') at Mission San Juan Capistrano, the oldest (circa 1790s) existing facilities of their kind in California. In the Spanish colonization of the Americas, bloomeries or "Catalan forges" were part of 'self sufficiency' at some of the missions, encomiendas, and pueblos. As part of the Franciscan Spanish missions in Alta California, the "Catalan forges" at Mission San Juan Capistrano from the 1790s are the oldest existing facilities of their kind in the present day state of California. The bloomeries' sign proclaims the site as being "...part of Orange County's first industrial complex." The English settlers of the 13 colonies were prevented by law from manufacture; for a time, the British sought to situate most of the skilled artisanry at domestic locations. In fact, this was one of the problems which led to the revolution. The Falling Creek Ironworks was the first in America. The Neabsco Iron Works is an example of the early Virginian effort to form a workable American industry. In the Adirondacks, New York, new bloomeries using the hot blast technique were built in the 19th century. Bloomery iron furnace along Bloomery Pike (West Virginia Route 127) near Bloomery, West Virginia, United States. ^ "The History of Forging - Now and Then". Canton Drop Forge. Canton Drop Forge. ^ "Some Aspects of the Metallurgy and Production of European Armor". Archived from the original on 22 April 2002. Retrieved 14 July 2012. ^ H. R. Schubert, History of the British Iron and Steel Industry (1957). R. F. Tylecote, History of Metallurgy (1991). ^ "Bloomery process". Encyclopædia Britannica. Retrieved July 15, 2017. The final version of this kind of bloomery hearth survived in Spain until the 19th century. ^ Gordon C. Pollard, 'Experimentation in 19th century bloomery production: evidence from the Adirondacks of New York' Historical Metallurgy 32(1) (1998), 33–40. Wikimedia Commons has media related to Bloomeries.